Canine sled teams travel between 70 and 100 miles per day through some of the harshest conditions on Earth on limited sleep. On average, a dog can lose 10 pounds of body weight during the course of the 8 to 13 day race. Dogs push through severe blizzards and sub-zero temperatures. With strong winds, the windchill can reach -73 degrees. Ailing dogs are often dropped from the race due to injury, illness, exhaustion, or not wanting to continue. With today’s crisis of dog homelessness, no puppies should be bred for commercial purposes, especially when the breeder cannot guarantee care for each puppy born. No dog deserves to live his or her daily life on a chain, and no dog should be forced to risk his or her life and well-being to win prizes and fame for humans. Paws Down! To corporate sponsors of the Iditarod race in Alaska. Every year in early March, up too 100 mushers lash their teams of huskies to sleds and begin the 1,000 mile trek to Nome, Alaska. A century ago, sections of the route were traveled by dog sleds to transport mail, medicine, and much-needed supplies through remote areas of Alaska that could not be practically accessed any other way. Today, the men and women who race this route as competitors in the Iditarod Trail Sled Dog Race can reap sizable cash prizes, often at a steep cost to the dogs who pull them to the finish line. Running the Iditarod is nothing like long distance hiking or recreational mushing with one’s companion dogs. Canine sled teams travel between 70 and 100 miles per day through some of the harshest conditions on Earth on limited sleep. On average, a dog can lose 10 pounds of body weight during the course of the 8 to 13 day race. Dogs push through severe blizzards and sub-zero temperatures. With strong winds, the windchill can reach -73 degrees. Ailing dogs are often dropped from the race due to injury, illness, exhaustion, or not wanting to continue. In fact, of the 16 dogs that comprise a single team, only half (or less) may make it to the finish line in Nome. However, that does not necessarily mean the dropped dogs are evacuated to a clinic. In 2013, 5-year-old Dorado was dropped at a checkpoint by his musher after he became too physically exhausted to continue. Still, Dorado was not brought to a mobile clinic or even brought indoors. Instead, Dorado and about thirty other dogs were chained out in the snow. The following morning, his stiff, dead body was found buried under a snow drift. A later necropsy showed he had asphyxiated to death. 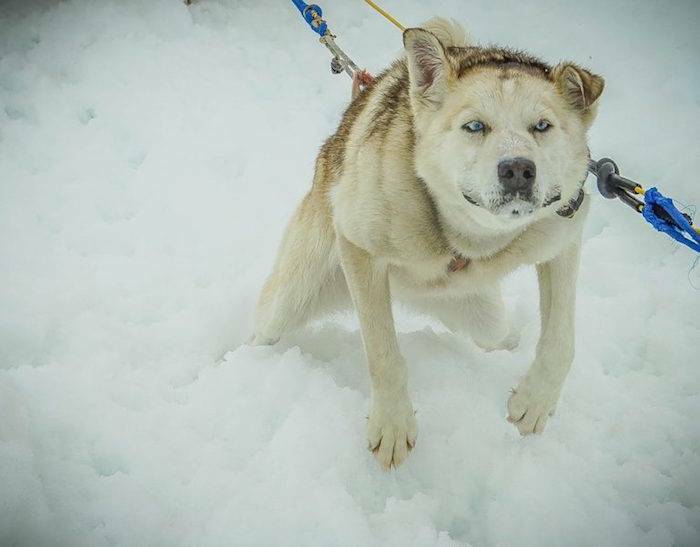 While Dorado’s death was bad enough, one death is considered a “normal” year on the Iditarod. A few years prior, in 2009, six dogs died in the race. Many mushers who compete in the Iditarod own and operate their own kennels where dogs are bred and trained. A single team consists of 16 dogs, so most sled dogs aren’t kept in cozy home environments. When not training or racing, most sled dogs are are kept in kennels or on chains outside. Puppies who do not make the grade and dogs retired from racing may find themselves without a home. Some are relinquished to non-profits, some are abandoned at animal shelters. In addition to the cost breeding, housing, and training the dogs to run, a $4,000 entry fee is required of each musher to enter the race. That’s a major investment for competitors, but for winners, the prizes can be substantial. In 2016, the first place winner was awarded $75,000 cash and a new Dodge Ram truck valued at $40,000. Keep in mind, this is just for the 1st place winner. Last year, $793,008.00 in cash and other prizes from sponsors were awarded across 71 competitors. Winners and competitors also earn funds from speaking engagements, regular sponsors, and dog sales. Some double their kennel operations as tourist attractions.